After leading the Genting Casino Coventry Blaze to two straight Playoff finals, winning in 2015 and suffering defeat a year later, Chuck Weber departed the club for the AHL’s Rochester Americans. Replacing the American was Danny Stewart, a former player who had previously spent four seasons with the organisation winning the Elite League three times, a Challenge Cup and Knock-out cup. With a core group of players retained, including Stewart's chosen Captain Jordan Pietrus and the club's top-scorer the previous season Brett Robinson, the Fort McMurray native began putting together the pieces to build a squad with "Blaze DNA". Signings of the likes of former ECHL Captain and Kelly Cup winner Matt Marquardt, and a top-scorer in the well respected Danish league, Robin Bergman helped build a great deal of excitement as the Stewart era began with an extended pre-season campaign. High-scoring affairs followed, with the club's first ever German player Björn Bombis particularly catching the eye. As the Elite League season, and an ultimately unsuccessful Challenge Cup campaign got underway though, the goals suddenly dried up. Away wins in Cardiff and Belfast offered some early signs of hope but similar levels of performance and result were never to materialise. As the offensive woes continued, Darcy Zajac, a veteran of over 250 AHL games became the first casualty. In came over a point-per-game at DEL2 level, Taylor Carnevale, the 25-year-old centreman lasting just 5 games before Coach Stewart dipped into the player market again. Arriving were an American duo with some serious pedigree, cousins Barry Almeida and T.J Syner. Bombis, who after his early season exploits, struggled to make an impact the other player sacrificed. All of a sudden Coventry's scoring woes looked behind them as the pair who have played the majority of their careers together, not least winning the ECHL's Kelly Cup with Reading Royals in 2012/13, quickly found themselves at the top of the club's scoring charts. Out of the blue, Great Britain International Ben Davies became a further addition following a short-stint in North America as the team's owners, backed by some of the organisation's highest ever crowds, heavily invested in the squad in an attempt to move up from the lowly position which the club found themselves in. Despite solving the offensive struggles, following a disastrous Scottish triple-header weekend and a tough Christmas run against their Erhardt Conference rivals, Blaze continued to struggle for consistency. Defensive mistakes and a number of Jekyll and Hyde like performances left Stewart's men sitting outside of the much prized Playoff places. It wasn't all doom and gloom at the Skydome though, not least in part to the impression which 6'5" Garrett Klotz had made on the Elite League, dropping the gloves no less than 12 times. Liam Stewart too, with his tireless work-ethic and penalty-killing exploits drawing the adulation of the Coventry faithful, proving doubters who pointed to his signing as a PR stunt wrong. With Syner and Almeida continuing to tear up the scoring charts, Brett Robinson again producing his best form in the second half of the year and Robin Bergman finding the net on a more regular basis, the New Year saw signs of improvement. A most notable game coming the second week in January as Blaze at one point in a match-up against the Steelers on home ice found themselves without all five recognised import defencemen. In the face of adversity, Matt Marquardt scoring a goal which lifted the Skydome roof off. Sadly, Sheffield were to find a way back into the game and go on to win in overtime but the moment felt a significant coming together for the 16/17 group of players. With influential defenceman Kevin Noble missing almost all of January and February, in amongst a run of positive results against Gardiner Conference opposition, also, unfortunately came several heavy defeats to title chasing Erhardt clubs, leaving Blaze fighting for the playoff lives with just four games to go. Home overtime losses to Fife Flyers and Braehead Clan turned out to be a dagger in the Blaze heart, as further defeats to Belfast Giants and Sheffield Steelers left Coventry in a ninth placed position and out of the Elite League playoffs for the first time in their history. Two further points of interest to end the season review, are that of the Support 25 campaign and the retirement of the club’s longest standing player #17 Russ Cowley. With help from the world-wide hockey community, in the space of six weeks, the organisation were able to raise over £40,000 to support one of the team’s greatest ever players, Adam Calder in his fight against Cancer. The end of the current campaign also sees the retirement of Russ, a 15-season veteran for the club, the versatile Great Britain International hanging up his skates with over 800 Elite League games on his CV, second most of any player and leaves as Coventry’s all-time club appearance leader. Coventry Blaze’s 2015/16 season was a slow-burner throughout - eventually catching fire in the playoffs before being finally extinguished in the last game of the Elite League season. The notable moments had come in the Continental Cup third round when the Blaze traveled to Poland. Two confidence boosting wins once again left Blaze with a winner-takes-all final match against the host team. With just 15 minutes of a tetchy game against GKS Tychy remaining Coventry led by two goals, only for the Poles incessant pressure to break the resistance and three unanswered goals put them through to the next round instead. In the final two months of the league campaign, team and individual form picked up, thanks in part to some well-timed roster changes – with Jordan Pietrus, who arrived in October, ending up one of the club’s leading goal scorers, and Chris Bruton, who arrived in a swap deal from Braehead, adding grit and skill on a potent line with revitalized top point scorer Brett Robinson. Coventry did enough to earn the eighth and final playoff spot by edging out the reformed Manchester Storm franchise. The post-season saw Coventry defying the odds in their efforts to retain their playoff crown - firstly in the two-leg quarter final stage against the number one seeded league-winners Sheffield. By the end of two periods in the second leg the teams were tied on aggregate, but it was Coventry who held their nerve and scored twice in the final period to progress to the Finals weekend. In the semi finals the second seed Cardiff Devils were no match for a Blaze team on a roll, with a four goal opening period and a hat-trick from Bruton leading Coventry to a 6-2 win and a place in a second successive final. The side from the Skydome left everything on the ice in the last game of the season but it wasn’t to be this time, as the Nottingham Panthers ran out 2-0 winners and ended Coventry’s valiant efforts to retain the trophy. Brian Stewart nominated for Elite Awards ‘Netminder of the Year’. Brian Stewart elected to Second All Star team at Elite League Awards. The 2014/15 season was one of two very different halves for the Coventry Blaze, but one which culminated at the end in trophy celebrations for the first time in five years. By the summer of 2014, Marc LeFebvre had done enough at the end of the previous season to convince the club owners to keep him on as Head Coach to sign his own team. His summer recruitment would see the arrival of several players who would prove to be key down the final stretch - most notably 6ft 5 goalie Brian Stewart, whose string of star performances would see him named the Elite League's best netminder. A solid first month of results were soon forgotten and by November Coventry found themselves in the league's bottom two and hanging in the Challenge Cup by a thread, prompting the owners to take the tough decision to relieve LeFebvre of his duties. But the most pivotal moment of fate in Coventry’s history was to intervene, as they were able to secure American Chuck Weber - a vastly experienced two-time ECHL champion - as LeFebvre’s replacement within a few weeks. Early progress was slow, but Weber's influence soon bore fruit as it saw him take largely the same squad and evolved them into a hard-to-beat outfit that eventually finished in a decent sixth position. And having looked all but out, Challenge Cup interest was eventually only ended at the semi final stage to the season's bogey side, Cardiff Devils. It was in the playoffs though that Weber's side put it all together for an exhilarating, and scarcely believable, finale. After edging out the Nottingham Panthers over two legs to make the Finals weekend, a spirited comeback in the semis paved the way for Ben Arnt's penalty shootout winner to knock out Belfast. In the final against league champions and reigning playoff winners Sheffield, Coventry stunned the National Ice Centre by racing into a four goal lead by the halfway mark. Steelers' comeback came too little and too late, leaving captain Ashley Tait to lift the Playoff trophy again, just as he had when Blaze had last won it ten years earlier. The 2013-14 season was a story of inconsistency at the Skydome Arena, both of team performance and line-up, as the Coventry Blaze desperately sought to find the magic formula. Mathias Soderstrom had taken the reigns as Head Coach from stalwart Paul Thompson and made some interesting summer roster moves, including the acquisition of highly-rated Michael Henrich to join brother Adam, and bringing back former Blaze star Ashley Tait after six years away. Of the signings, sniper Ryan Ginand proved the big success as he went on to end up as the Elite League’s top goal and point scorer. Even before the first game however, changes beyond the club’s control had already started to alter the roster - returning All Star defenceman Michael Schutte elected instead to retire, while fan favourite Mike Egener’s treatment for Guillain-Barré Syndrome stunned everyone. Early season promise wasn’t sustained as Soderstrom tried to learn his trade, and by November his team was changing faces as management sought to give the flagging team a boost, with two starting imports returning to North America and being replaced by the return of Shea Guthrie from Sweden and the even more surprising early return of Egener. 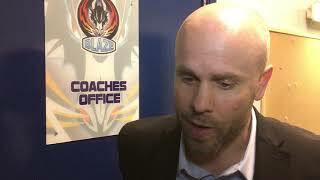 By early February, a combination of factors had left Coventry narrowly in the eighth and final playoff spot in the overall league table, leading the Blaze hierarchy to make the bold decision to replace Soderstrom as coach with another former Coventry player, Marc LeFebvre, who left his role as assistant coach in Sheffield. LeFebvre succeeded in qualifying Coventry for the playoffs, but only in the final game of the regular season - an edgy 1-0 overtime victory in turn eliminating their opponents, the Cardiff Devils. A narrow home leg defeat to the Sheffield Steelers in the quarter-finals left the Blaze still in with a shot of the final four, but the subsequent 6-1 second leg capitulation was a sorry way to end a turbulent season. Coventry’s tenth Elite League campaign in 2012-13 certainly provided more entertainment for the increased attendances at the Skydome Arena, as the club improved their placing in every competition thanks to a new batch of cult heroes. Backstopped again by the popular Dane Peter Hirsch, the defence saw big Benn Olson leaving his mark on the Elite League in more ways than one alongside league all-star Michael Schutte, leader Mike Egener and the ever-emerging talent James Griffin, while up-front the Leeb brothers, Greg and Brad, brought vast experience and skill to go with the all-action style of Dustin Cameron, returning star Shea Guthrie and a new crop of young British talents. The star attraction during the middle of the season though, had been Anaheim Ducks’ NHL forward Matt Beleskey, who made a memorable impact bleeding blue for a three month spell during the temporary NHL lockout. When he returned to the States in early January, his replacement Adam Henrich proved a shrewd signing as he picked up Beleskey’s points production and proved to be one of the best mid-season signings in Blaze history as he helped Blaze to a fourth place league finish. In the playoffs, a quarter final match-up against the Steelers was a tricky test, but a captain’s performance from Shea Guthrie saw the Canadian hit a second leg hat-trick including the tie-winning goal in overtime to send Coventry to Nottingham. They fell to Belfast at the semi final stage, but a big win in the final bronze medal playoff game against Cardiff saw Head Coach Paul Thompson end on a winning note after 18 years behind the bench, as he set to take on a new challenge in Sweden and handed the baton onto assistant Matt Soderstrom to write the next chapter in Blaze history. 2011-12 will go on record as one of the most trying both on and off the ice for Coventry as they struggled to improve on the disappointment of the previous season. Coach Paul Thompson went for a mix of mostly experienced Brits and imports with previous Elite League experience, but inconsistent form throughout the year meant the Blaze would rarely trouble the teams above them whilst hovering in mid-table. The passing of Grand-Slam winning legend Wade Belak and a heavy 10-1 loss in Nottingham in the Challenge Cup in the first week of September rocked the club as the new side was trying to gel, and more shocks were on the way for Blaze fans through the season. By the time Coventry were playing the final two games of a Challenge Cup group they failed to get out of, experienced defenceman Dustin Wood had been jetted in from Asia to solidify a leaky defence and he had been influential in Coventry's next intriguing signing, Korean international, Woo-Sang Park. Park’s arrival was out of the blue, as was the departure of star goalscorer Luke Fulghum to Sheffield, but the biggest shock came in early December when the club appealed to their fan base to help them get through an immediate, and serious, money shortage. The news brought out the best of the Coventry support and the wider British ice hockey community and the Blaze were fortunate enough to be able to ride out the remainder of the season. Back on the ice, Coventry geared up for the end of season playoffs by edging out Braehead for fifth place, largely influenced by new Canadian import Shea Guthrie, whose outstanding skill and ability to put points had lit up the Skydome Arena and the league as a whole. However, even Guthrie couldn’t win games on his own and, after a quarter final first leg draw with Cardiff which left the second leg as winner-takes-all, Cardiff’s superior quality in depth ended the Blaze season with a 4-1 second leg defeat. Season 2010-11 proved a disappointment at the Skydome as Coventry ended in their lowest Elite League position to date and without a trophy in their cabinet. Influential players Calder, Watkins and Stewart had all left along with several others but Coach Paul Thompson’s replacements all came with a pedigree for success. Though perhaps unlucky to be playing two of the big budget clubs in their opening four league games, a 0-4 record maybe on reflection was a premonition of things to come. Blaze’s initial recovery had proved strong, and in reeling off a club record 12 straight Elite League wins they shot back up into title contention. The Challenge Cup campaign had stalled at the group stage for the second year running, but in the Continental Cup back to back 6-1 wins put Coventry in pole position for a place in the Super Final. For the third time Blaze had a winner takes all final game against their hosts, this time France’s Rouen Dragons, but an under par performance resulted in a 7-3 defeat. That game was possibly the catalyst for the season to start falling away. The following week’s much-publicized brawl against Nottingham left forward Brad Cruikshank with a hefty nine game ban, while key defenders Jonathan Weaver and Brian Lee both suffered long injury set-backs. Most devastatingly of all, another injury, this time to Owen Fussey who was Coventry’s leading scorer at the time, put one of Blaze’s key men out for the season. Riddled with injuries the team went through a horrible three months of form and struggled more than a Blaze team for many a year. A sixth place finish left Coventry with a difficult tie against the Belfast Giants in the playoff quarter-finals, but after 125 minutes of hockey over two legs and the two deadlocked on aggregate it was left to a penalty shootout to finally put the Blaze down and out. Coventry Blaze celebrated their 10th anniversary season in 2009-10 and were given the perfect gift – a third Elite League title in four seasons that made it 10 trophies in 10 seasons since the move to the city in the summer of 2000. Coach Paul Thompson’s new signings were key as Coventry recovered from being runners-up the previous year to title winners again. Fan favourite Peter Hirsch added stability between the pipes, player of the year Brian Lee led by example on the blue-line, Greg Chambers provided creativity and skill, while hot-shot Luke Fulghum brought goals – and lots of them. The season started with a Challenge Cup run that fell flat at the group stage, but the Elite League’s newly created 20-20 hockey tournament proved more of a success and Blaze were losing finalists to the Sheffield Steelers. With the cups removed from the priority list, the league became Coventry’s everything for six months, and the race for its title was to become one of the most fascinating for years, going all the way to the final weekend of the season after swinging one way or another. To avoid a final day showdown with second-placed Belfast, Coventry as narrow leaders needed to win their penultimate game in Edinburgh. Blaze gained a two-goal lead, but with a minute to go found themselves a goal down and the big title-decider against the Giants looked likely. But Captain Adam Calder came up bigger than ever before for his team – his second of the game tied the scores with only 28 seconds remaining and took the game to OT, before his hat-trick goal sealed an exhilarating comeback and the league championship. However, dragging themselves over the finishing line had took its toll on Blaze’s battered and bruised team, and despite making the Playoff Semi-Finals for a fourth year running, they were well-beaten in Nottingham by the Cardiff Devils. By recent standards, the 2008-09 season was to some degree a disappointment, with the club winning no major silverware for the first time in three years. The club reacted to losing the spine of their team, in All-Stars Trevor Koenig and Neal Martin and talismanic captain Sylvain Cloutier, by building a young, mobile roster designed to last the distance. However, they lacked consistency in key areas and went through periods of poor form. All of Head Coach, Paul Thompson's new signings were familiar to British hockey bar two - Scott Kelman and Corey LeClair - who both arrived from the East Coast league. The first half of the season saw good progress, with the club taking the Charity Shield in overtime against Sheffield and qualifying for the Challenge Cup semi finals. A third representation by the club at the Continental Cup saw a winner-takes-all final game against hosts Bolzano, where a controversially disallowed Coventry goal proved the major turning point in an eliminating 1-0 defeat. Come January 2009 thought, the wheels started to fall off Blaze's wagon - Kelman and LeClair were replaced after failing to adapt and the Knockout Cup was relinquished in embarrassing fashion against Belfast over two legs. The changes in personnel failed to bring enough of a change in fortunes, with Coventry falling over two legs to the Giants again in the Challenge Cup semis before finishing a hefty 11 points behind Sheffield to take second in the Elite League title race. The last hope of a trophy came in the playoffs, but the season's arch-enemies Nottingham provided a final devastation with a crushing 6-2 defeat. The summer after Blaze’s second Elite League title proved far more settled than after the first, with the majority of the Championship team retained. Captain Ashley Tait departed after a five-year stay and was quickly replaced by fellow British international star Jonathan Weaver in the team’s big transfer story, while sniper Curtis Huppe arrived from Belfast and popular past-servants of the club, Russ Cowley and Matt Soderstrom, returned to Coventry for the 2007/08 season. Despite disappointingly relinquishing the Challenge Cup early on with failure to escape their group and make the semis, Blaze hit the ground running in the league and kept going throughout the season. They were the British representatives in the Continental Cup once more, this time in Aalborg, Denmark, and although they ultimately missed out on a place in the next round, they produced one of the greatest results in the club’s history – a 3-2 overtime comeback win against Austrian giants Red Bull Salzburg. Domestically, it proved to be the Adam Calder show, ably assisted again by partner Dan Carlson. The Canadian scorer had a career season, hitting an astounding 58 goals and 125 points in Elite League competitions as he ended the year the club’s and the league’s MVP. Backed by continued All-Star netminding by Trevor Koenig, Blaze battled through adversity during the season and held off their challengers to finally seal a second successive, and third overall, Elite League title. By this time Coventry had also reached the Knockout Cup final against battling strugglers Basingstoke, but they needed a monumental four-goal burst in the final period of the second leg to seal a second trophy of the season – one which had proved elusive on two previous occasions. They gave all they had in the playoffs to reach the final against league runners-up Sheffield, but finally ran out of steam. A 2-0 shutout backstopped by Blaze grand-slam goalie Jody Lehman eluded them of a treble in what was already another memorable season in their history. With a wholesale revamp of the team, the 2006/07 season saw Coventry taking to the ice vastly more experienced for the challenge from back to front. League All-Star Trevor Koenig to man the pipes proved the team’s key signing, and the lethal partnership of the Grand-Slam year was reformed as Adam Calder and Dan Carlson both returned. Combined with proven past winners like Sylvain Cloutier and Samy Nasreddine, NHLer Rumun Ndur and the gritty Reid Simonton and Danny Stewart, Blaze had one of their strongest ever teams. The new squad started slowly, but gradually gelled into a formidable outfit with a never-say-die attitude, epitomized by an overtime comeback win in Edinburgh which seemed a lost cause with a minute to go. Despite reigning champions Belfast flying away at the top of the league, Blaze quietly went about their business, qualifying for both cup finals without defeat and maintaining a steady pace behind the Giants. Come early February, Blaze had evaporated the 11 point lead Belfast held at Christmas, and when the two met at the Skydome, an 8-0 hammering in Coventry’s favour proved the tide had well and truly turned. They were ran close, but a home win against Edinburgh with a few games remaining secured Blaze’s second Elite League championship in three years. A week later a second trophy was in the cabinet – an exemplary 5-1 win in Sheffield, cheered on by a large and loud travelling support, brought the Challenge Cup back to Coventry. The other two trophies eluded them thanks to the Cardiff Devils, with a shock 3-0 shutout on Skydome ice in the Knockout Cup final followed up by a narrow 3-2 success in the playoff semi-finals, but the season was a resounding success nevertheless. In the 2005/06 season, Coventry Blaze faced the enormity of trying to follow up their amazing season, but before it had even begun they had suffered devastating losses, with their entire first line and star netminder moving on, as well as three key players retiring. With replacements acquired, the team began slowly, edging into the Challenge Cup semis whilst trying to keep with the early pace-setters in the league. The season high came when Blaze were British representatives in the Continental Cup group stages, winning and drawing their opening two games before falling to French hosts Grenoble in the final, deciding game. The excursion appeared to set a curse on Coventry, and signalled the start of an incredible amount of bad luck which lasted right until the last second of the season, with major and minor injuries being the plague of Blaze’s year. Blaze took a three-goal lead in a repeat of the previous year’s Challenge Cup final against Cardiff, but the second leg, which should have been their highpoint, turned into their lowest. The Devils wiped out the advantage, with the final goal an agonizing 20 seconds from time, and were the only team to score in the deciding penalty shootout – breaking Coventry’s hearts. The remaining months were little better as the team finished fourth and then failed to make the playoff semis. Their last chance at success came in the final of the hastily created Knockout Cup in front of a new record Skydome crowd, but there was still enough bad luck left. Another shootout loss rounded out a season Coventry Blaze would rather forget. If the previous season had finished disappointingly, season 2004-2005 ended in the best possible way after the greatest seven months in the club’s history. Although stalwarts such as netminder Jody Lehman and new captain Ashley Tait returned, coach Thompson changed many, bringing in more size, more speed and more quality. His greatest coup was signing former-Superleague defenceman Neal Martin, who went on to become the league’s Player of the Year and selected to the All-Star team. The brand-new first line of Dan Carlson, Adam Calder and Andre Payette proved potent all through the season, as Carlson’s speed and vision proved the perfect set-up for Calder’s finishing and play around the net, while Payette angered many by clocking up almost 500 penalty minutes for himself. The season started well as they qualified from their group for the semi-finals of the Challenge Cup, kept with the early pace-setters at the top of the league and even got over the disappointment of losing out on NHL forward Eric Beaudoin on a lock-out deal by bringing in high-scoring centreman Chris McNamara. The turning point in Blaze’s season came in November, as Thompson cut Slovak Michal Vrabel and brought in Toronto Maple Leafs’ NHL defenceman Wade Belak, sparking a run to the end of the regular season where they only lost once in regulation time. A Doug Schueller howitzer against Nottingham sent Coventry to their first Challenge Cup final with a 5-4 aggregate victory, before they destroyed Cardiff 6-1 in the first leg of the final. A fight-strewn second-leg a week later saw Coventry battle under pressure to win the game 5-4; securing their first trophy of the season, 11-5 on aggregate. As Cardiff faltered, the league eventually became a two-horse race between Coventry and Belfast. The Blaze’s consistency had always kept them a step ahead of the Giants and eventually they had the chance to wrap it up the title bid with three games to go. In front of a new record crowd at the Skydome, Coventry dispatched of London 5-1 and secured their place as the number one team in Britain. Now the bid was on to add the Playoff crown to their trophy cabinet. After qualifying comfortably from their playoff group for their first finals weekend, a Jody Lehman shutout was significant as Blaze beat Sheffield 3-0 in their semi-final. The Playoff Final against the home-town Nottingham Panthers was one of the best of recent years; agonizingly tight and eventually going into sudden-death overtime tied at 1-1. 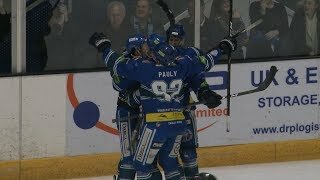 But just over three minutes into the extra session, captain Ashley Tait raced in on goal and scored the game-winner, securing Coventry Blaze’s place in British Ice Hockey history forever as winners of the elusive Grand-Slam. Season 2003-2004 saw another major change in the club’s progress as they took part in their first season as a top-flight club in the newly-formed Elite League. Coach Paul Thompson stayed true to the team which had won the double in the BNL the year before, replacing only three players; defencemen Steve O’Brien and Steve Gallace coming from the ECHL to replace Andreas Moborg and Ron Shudra and college-graduate Graham Schlender replacing folk-hero Kurt Irvine. The first game of the league saw another first for the club as they flew to their game in Belfast and turned heads by beating the previous year’s Superleague playoff champions. A 6-1 win over Sheffield in October and an 11-0 thumping of Manchester in December were highlights as the team bobbed along with the leaders at the top up until Christmas, with defenceman-turned-forward Steve Gallace going goal-crazy. In the New Year, Blaze petered away and wins were hard to come by, but they still finished a highly-respectable third in their first year in the top flight. The playoffs however, got off to an awful start as they lost in Cardiff minus coach Thompson, serving a one match ban following a bench clearance against the Devils the weekend before. With only four games in the group stage, Blaze were unable to get going after that loss and ended the season in disappointing fashion by finishing winless in the post-season. Despite this, the team had made significant progress and had made themselves ones to look out for in the Elite League. With eight new players on board the Blaze kicked off their inaugural season at the Skydome with a decent run in the Benson & Hedges Cup and, after losing in their opening BNL game, proceeded to set a blistering pace in the league competition throughout October and November. The loss of key players, Craig Chapman (returned to USA) and Steve Chartrand (injury) at the turn of the year led to a dip in form which resulted in an eventual fourth place finish. The Play-Offs were difficult and the Blaze were unable to repeat the previous years semi-final appearance. However, the most important factor of the year was the growth in fan base from a few hundred at the start of the year to over 2000 by the end of the play-offs. Season 2001-2002 saw few changes in the line up (Canadian Ian Burt replacing Henrik Sjodin between the pipes, Andrew McNiven joining in place of AJ Kelham and Steve Carpenter returning to Blaze colours being the main changes.) The Season started with fine run in the Findus Challenge Cup which saw Blaze qualify for the Semi-Finals. This run included the first return visit to Hobs Moat Road in Solihull to take on the reformed Barons (both games saw Blaze comfortable winners). An injury to McNiven saw ex-Steeler/Panther/Giant Steve Roberts join up with the Blaze and set the league on fire. A storming October/November saw the Blaze matching new-boys Dundee Stars all the way. The Finals weekend of the Challenge Cup saw Blaze comeback from 3-0 down in the semi-final to dramatically beat Basingstoke and go on to meet Fife in the Final. Flyers dominated the Final however, as tired legs caught up with Blaze. Returning to the league, and the Blaze continued in fine form throughout splitting results with the Stars. Stars greater consistency, and their ability not to drop points against mid-table teams left them top of the league with the Blaze runners-up again. The Play-Offs saw the Blaze top their qualification group and then beat Guildford, resoundingly, over the two legged semi-final. The Final saw them take on the Stars and loose out by the narrowest of margins, 8-7, over the two legs - bridesmaids for the third time in the season. What a difference a year makes! Season 2002-2003 saw another evolution not revolution in the playing staff with Jody Lehman replacing Burt between the pipes, Joel Poirier replacing the departed Roberts, and GB forward Ashley Tait joining being the major additions. Blaze entered the ISL Challenge Cup at the start of the season, and ran a couple of ISL teams close but used the competition primarily as warm up for the real business in hand. The Findus Challenge Cup saw Blaze storm into the Finals where they met the Newcastle Vipers. Probably the worst performance of the season saw them come second again with a 0-3 loss to the Vipers. This was the kick start though for the remainder of the season and a superb run of form saw the Blaze wrap up the league title with a stunning victory in Dundee. This was followed up with a truly amazing unbeaten play-offs run, the Final being a hotly contested affair against the rejuvenated Cardiff Devils, narrow victory in Cardiff was followed by a first ever capacity crowd (2750) at the Skydome for a triumphant Sunday night that saw Blaze lift their second trophy of the year. Shortly after the final, Blaze (and Devils!) announced their move into the newly formed Elite Ice Hockey League, and commenced preparations for their first ever season in the top flight of hockey. The Solihull Barons evolved into Solihull Blaze before the start of the 1996-1997 season, finishing second in the Premier Ice Hockey League. The 1997-1998 season was one of the most successful on record as Blaze were victorious in the English National League and the ED1 North. Nine goals in each leg of the play off final against Chelmsford Chieftains gave Blaze their third trophy of the season. The club moved into the new nine team English Premier League for the start of the 1998-1999 season. In November 1998, they were losing finalists in the English Cup. But the side were once again crowned league champions in March with a victory in Chelmsford on March 20. Play-off success followed in April with a 5-3 two-legged victory over season-long rivals, Milton Keynes Kings. The following season, Blaze made a semi-final appearance in the 1999-2000 British National League play-offs, losing to eventual winners Fife Flyers, having finished in seventh position in their first year back at British National League level. In May 2000, the club announced that they would be heading to new surroundings, Coventry Skydome for the 2000-2001 BNL campaign.